Abigail Kalscheur moved to San Francisco from Madison, Wisconsin in the fall of 2011. After graduating with a degree in the botanical sciences from UW-Madison, she reoriented her career path back into the sports arena. Passionate about soccer from a young age and playing through college, coaching was a natural fit and she has worked with age groups ranging from U9 recreational teams to multiple high school varsity squads across the states, as well as high school age travel club teams and the Cal North ODP program. 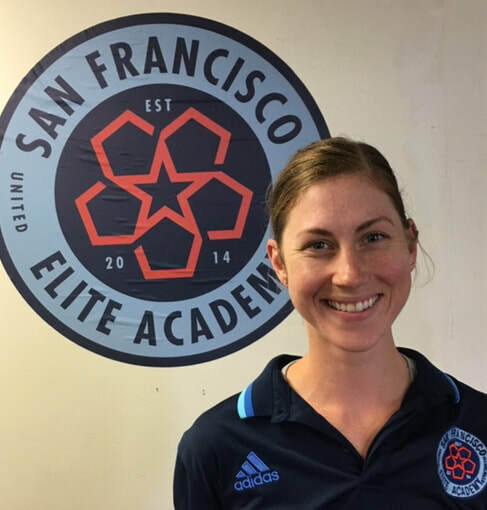 ​Abigail works in the office at SF Elite Academy as the Director of Internal Operations during the day, and coaches the SF Elite Academy 2007 Girls team by night. She currently holds a USSF B license. Grateful to a sport that has encompassed a healthy lifestyle, blossomed into a career, and created innumerable friendships on and off the field, Abby is passionate about relaying the message of the sport and preparing future generations for their own life-long involvement.